1.) Use reusable dishes and water bottles. 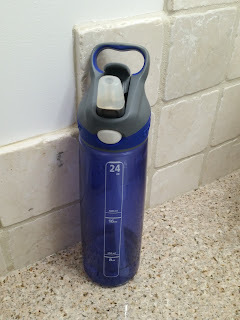 A person can cut a lot of unnecessary waste if they pack a reusable water bottle and dishes for their lunch every day. You also save money because you aren't constantly having to purchase disposable items. There are so many great options today for reusable dishes. I really like the options that Tupperware has to offer. 2.) Use rags. Hubby and I made a decision a few years back to try and cut back on our use of paper towel. We made some rags out of old towels and I purchased one pack of microfiber cloths at the hardware store. We have been shocked at how much less paper towel we purchase! We buy paper towel maybe once a year. It has definitely saved us money! 3.) Try to purchase locally grown food. This one can be difficult because we are Canadian and our growing season is pretty short. I will purchase Canadian produce when it is available and in season. When Canadian produce isn't available, I try to purchase produce grown in the United States as the U.S. is our closest neighbour. Our grocery store is very good at encouraging local produce and farmer's markets can be great places to find food from growers in your area. How do you help out the environment? I would love to hear your ideas! I am so obsessed with water bottles like that! I have so many!